The player will make an Ante and/or Pairplus bet. 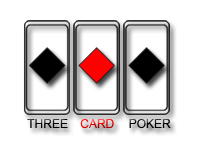 The dealer will give the player three cards, as well as giving himself three. 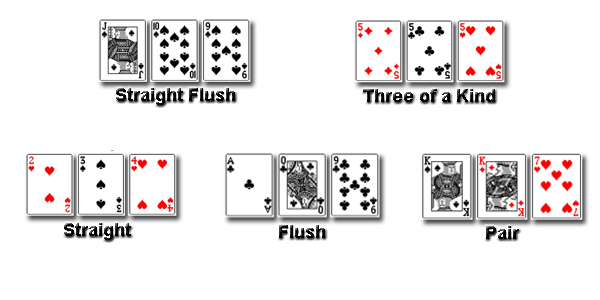 The dealer’s cards will remain face-down, while the player may look at his hand. If the player made an Ante bet, he will need have to raise or fold. If the player folds, he will lose the Ante wagered. If the player raises, they must make a Play bet, which will be equal to the Ante amount. This is when the dealer will turn his cards over. The dealer will need a Queen or higher to qualify and continue. If the dealer does not qualify, the player will win even money on the Ante bet, while the Play bet will push. If the dealer does qualify, both hands will be compared to see who has won. If the player has a better hand, the Ante and Play will pay even money. If the dealer has a better hand, both the Ante and Play will lose. If there is a tie, then the Ante and Play will push. If the player placed the Ante, and got a straight or better, they will receive an Ante bonus; regardless of what the dealer had.